theSuburbs.org.uk - the original Ben Folds website - Benvivor IV gets physical. Kind of. Benvivor IV gets physical. Kind of. Now that the competition has settled, and the competitors are getting truly, well, competitive, I thought I'd up the stakes by offering the winner of Benvivor IV some actual, factual, physical prizes! That's right, I've been putting together a grab-bag of Folds-related jun... I mean, goodies, including an exclusive T-shirt, a hard-to-find CD copy of Majosha's "Shut Up and Listen to..." album (recorded directly from the original LP - no low-quality mp3s here! 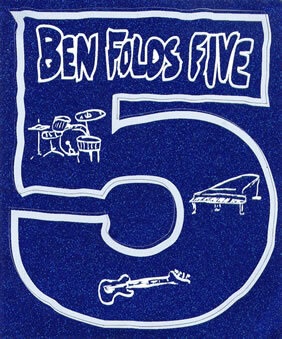 ), a blue and glittery Ben Folds Five promotional sticker in the shape of a '5', and a bootleg of your choice from my collection. How to win such a glorious array of Foldsian delights? Simple. First, you have to already be in the competition. Secondly, you have to win it. Good luck, and may the biggest geek win!